There is a revealing new profile of the man who led and personifies modern conservatives’ mastery of TV—Fox News’s Roger Ailes. At least the shtick is consistent. There is a restaurant in New York City called Michael’s…. It is not the kind of place an average American goes to. It is not even the kind of place an average New Yorker goes to. It is a clubhouse for media people and for only media people—for exactly the people whose contempt Roger Ailes regards as an inspiration and a reward for a job well done. 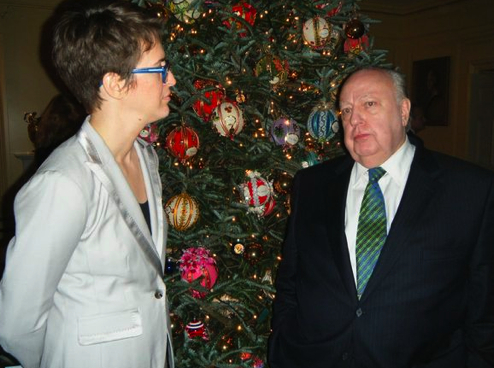 Does Roger Ailes have a table at Michael’s? He has the best table at Michael’s…. Because he’s concerned about his family’s safety, and because the problem with America is that there are actually Americans there, he started buying all the houses around him and leaving them empty. For fifteen pages, the profile give Ailes the Fox treatment—complete with the conclusory title, “Why Does Roger Ailes Hate America?” In an ironic nod, Junod deploys the proto-patriot voice that, prior to Ailes’s reinvention of cable news, was largely confined to movie trailers and talk radio. But the most striking parts of the story are more technical than ideological. Ailes comes across as a man completely in touch with his medium. He often watches shows on mute, because sound—what people are actually saying—is always secondary on television. Ailes used this approach to rate anchors, as he recounted in his 1989 book, You Are the Message; Getting What You Want by Being Who You Are. (Everyone has an Oprah side.) Basically, Ailes would test talk show hosts by watching them “with the sound turned off” for about ten minutes. Every three seconds. Indeed, while many media companies are clumsily chasing the faster, cheaper competition online, television is bigger than ever. Americans now consume more TV than ever before. (The average person watches a galling 4.8 hours per day.) And today’s TV, especially cable, is even fast enough and sensational enough to match the demanding tastes of digital natives, the first generation to grow up with the web. Ailes always had his eye on programming that popped, even if the audience was not listening, and he has rarely felt restricted by the duties or notions of journalism that bind some of his competitors.